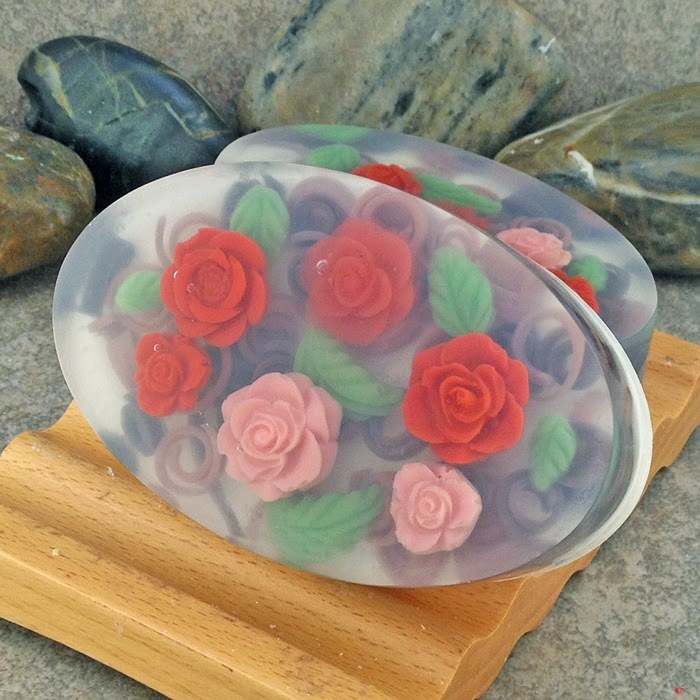 Alaiyna B. Bath and Body: New Embedded Soap Designs! I love creating these types of soaps as they are so beautiful and unique. It takes quite a long time to create them as it is a multi-step process. First is to create the embeds (flowers, fruits, curls, etc) and since several of my molds only have 2 - 5 cavities, it is a long and repetitive process, - pour the soap, let it harden, remove from the mold and continually repeat until I have all the embeds that I need. For the curls, once the soap is hardened, then it goes through the planer to shred and curl it. Once all the embeds are made, then the bars are made by layering hot soap, adding the embeds, layering again, adding more embeds - until the mold is full. 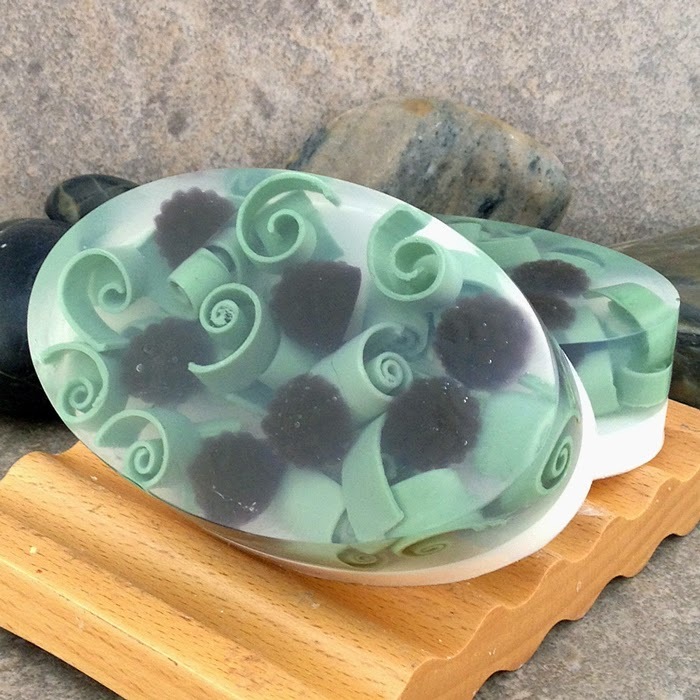 Things to keep in mind for creating these types of soaps. - I use SFIC bases for these soaps. The clear base has a yellow tint to it so I add a tiny amount of blue liquid (non-bleeding) colorant to remove the yellow tint. You have to be careful because if you use too much, you will then have a blue tint. The SFIC clear base also has a very slight haze to it and there is nothing I can do about that, so the closer to the surface the embeds are, the clearer they will look. - Temperature control of your layering soap is crucial. Too hot and you will melt the embeds, too cool and they won't stick together. I can only make up to 7 or 8 full size bars at a time because layering the embeds takes time and while doing so, the layering soap starts to cool and I avoid continual reheating of it as it tends to get gummy after a while. - I no longer add fragrance to the translucent layer. Many fragrances will cloud or discolor the soap. The cloudiness happens right away, but the discoloration (usually turns amber or golden yellow) can happen over time and ruins the look that took so long to achieve. I now only fragrance the solid layer that is beneath the embedded layer. Even with that technique, I only use clear (water white) fragrances as often as possible too. These are fragrance oils that are as clear as can be in their raw state. Fragrance oils can run from clear to dark yellow to almost brown. Brambleberry keeps a list of their "water white' fragrance oils which is a big help: Brambleberry Water White Fragrance Oil List. I have found no other vendor who provides this information. 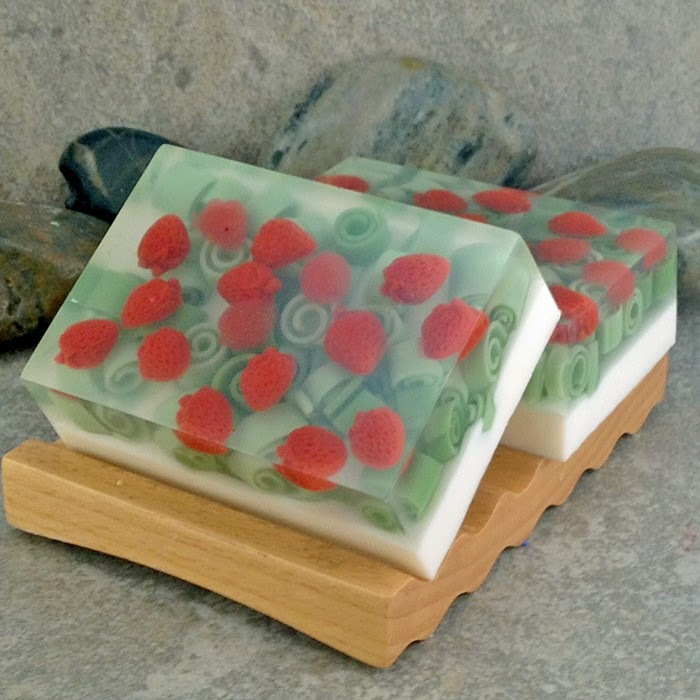 Here are my newest embedded soap creations - enjoy!